By buying this product you'll earn up to 2300 Rewards points. You need control to mix music well — control over levels, tones, dynamics, and clarity among other considerations. 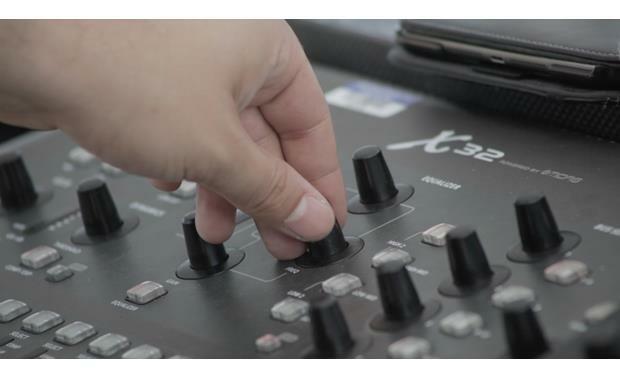 Behringer's X32 digital mixer puts that control at your fingertips with a touch surface that combines the analog feel of faders, buttons, and knobs with the awesome power of digital processing. 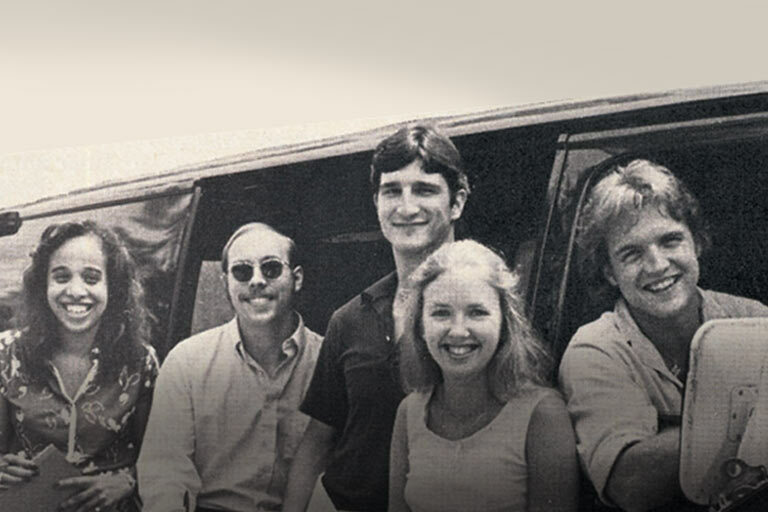 And Midas-designed preamps give each microphone input a high-fidelity start to its journey toward a great final mix. Besides 32 mic inputs, the X32 sports six auxiliary 1/4" TRS inputs and a couple of RCA inputs, so virtually any source can enter into this mixer's realm. Sixteen balanced XLR outputs provide the mixes for your PA speakers, monitors, or recording devices. Six 1/4" TRS and an RCA pair let you hook up even more outboard gear to your system if needed. You can assign the auxiliary inputs and outputs so they can be used as channel insertion points for outboard hardware. 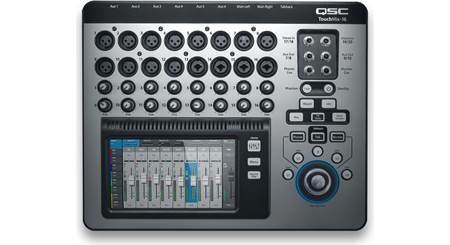 You can record 32 channels at once to your computer's DAW via a USB connection, for studio-quality multitrack live recording. 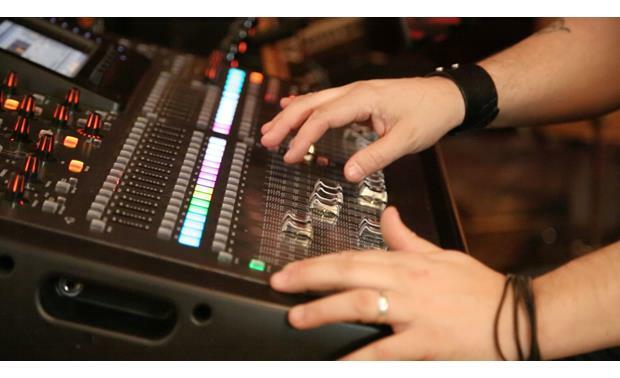 For multi-channel inputs, the X32 is compatible with digital snakes, so you can use thin Cat-5e wires to connect to the stage instead of a thick multicore cable. 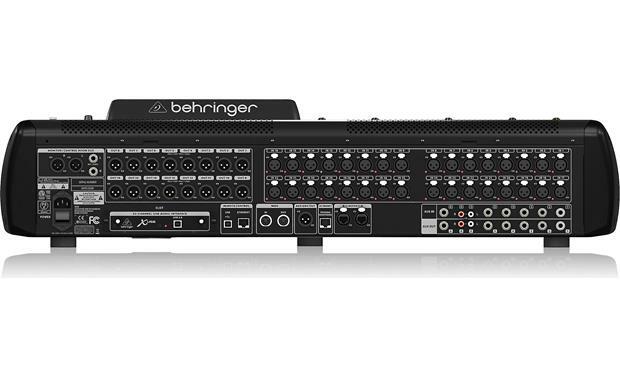 Another connection lets you plug in an optional Behringer P16-M personal mixer, via Ethernet cable, for musician-controlled monitor mixing. And you can plug in a router to run your mixer wirelessly from an iPad®, iPhone®, or PC via the free apps. Every input and output channel has access to the channel strip controls that include gain, phantom power, high-pass filtering, a noise gate, limiter/compression, 4-band parametric equalization, and bus assignments. A push of the view button by each effect brings up a more detailed description on the 7" display. The other plug-in type effects, like reverbs and delays, also show up on the screen as virtual hardware devices when selected. Actuators adjust onscreen parameters and let you see and control functions like routing, mute groups, and scene recall. Often, you'll want fast access to often-used functions, like changing a delay time or disengaging a reverb when a vocalist speaks between songs. 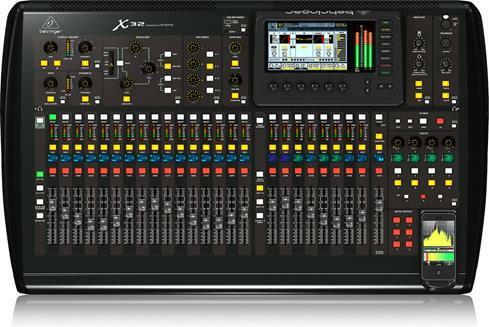 The X32 offers assignable controls that give you up to 36 different user-programmed functions at your disposal. 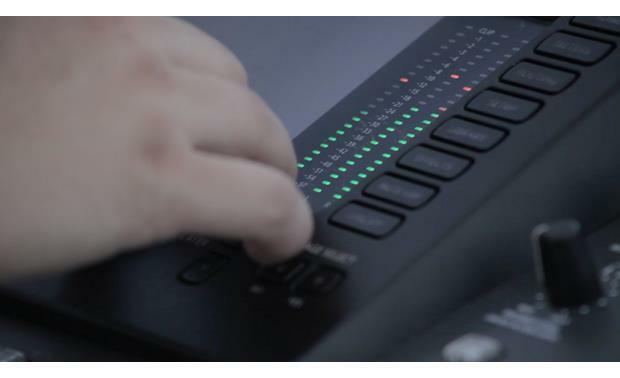 The first eight channels of the X32 can get assigned to Auto-Mix, which automatically lowers the levels of some of the mics when a prioritized mic is active, clearing up the sound in multi-mic panel discussions for instance. A 100-band RTA displays the spectrum of the sound so you can see any hot spots and dips that need equalization. 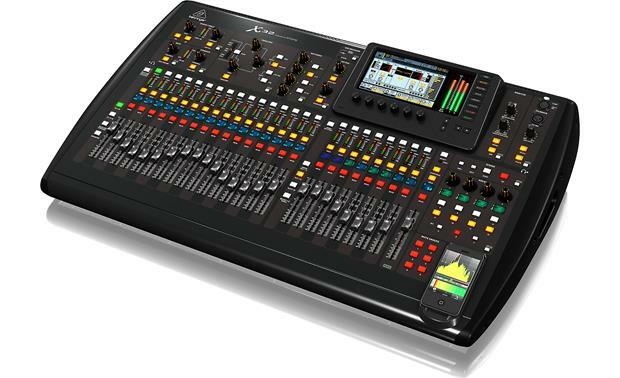 Overview: The Behringer X32 is a 40-input, 25-bus digital mixer designed for both live and studio applications. Its ergonomic control panel allows for a streamlined workflow with extensive signal processing, I/O routing, and studio integration. 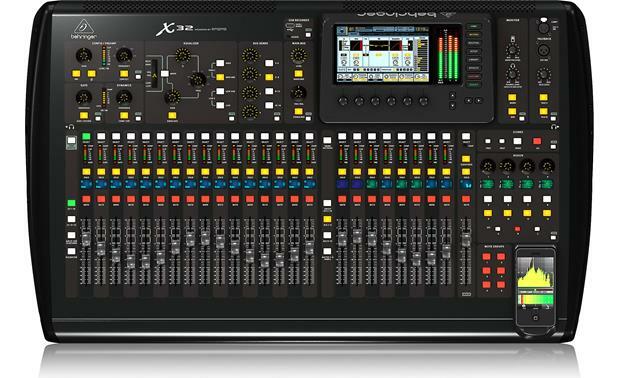 Some of the X32's key features include: 32 MIDAS-designed mic preamps, 25 fully automated motorized 100mm faders, 16 XLR outputs, 8 stereo effects processors (16 mono) with 60 effects available, high-resolution 7" color TFT display, iPad and iPhone apps for remote operation, and more. MIDAS Preamps: The X32's mic preamps, gain controls and A/D stages were designed and engineered by MIDAS, the company famous for their award-winning mic preamplifiers. This proprietary preamp design captures every nuance of the input signal. Gain setting is fully programmable and covers a total range of 72 dB, with a resolution of 0.5 dB per step. The input section uses audiophile-quality Cirrus Logic multi-channel A/D converters, which boast a 114 dB dynamic range. Virtual FX Rack: The Virtual FX Rack features 8 true-stereo, studio-grade effects engines, each assignable to any input, group, or output mix bus. Sixty high-end FX modules are available and include a range of reverbs, delays, EQ's, dynamics and more. AES50: Included on the rear panel are two AES50 RJ-45 ports. These offer up to 96 channels of bidirectional signal flow and are designed to integrate with the Behringer S16 digital stage box, which is a multi-input, pre-amp, break-out box for stage use. These ports can also be used to link other X32s together eliminating the need for signal splitters. 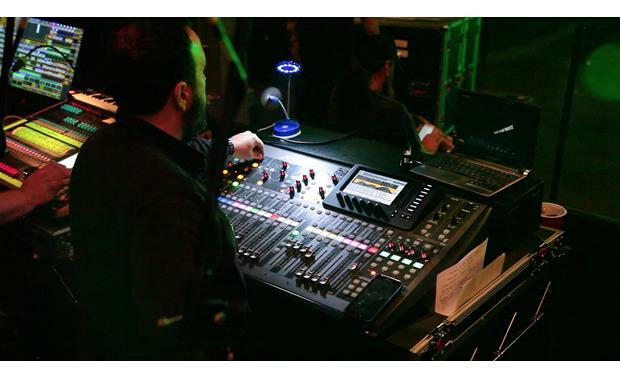 This is useful when one X32 is used as a FOH (Front of House) mixer and all of the input channel signals need to be passed on to a monitor mixer for the musicians. 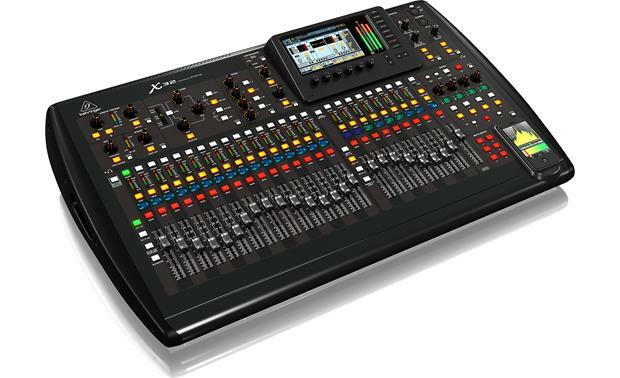 X-USB: Behringer's X-USB port is a rear mounted USB (Type B, 2.0) on an expansion board, that allows up to 32 tracks of recording and playback through your computer, supporting 44.1 and 48 kHz sample rates at 24-Bit resolution. Audio from a DAW can also be run through the X32's built-in FX engines, lessening the work load of the computer. The X-USB port resides on a removable board that can be replaced with optional expansion boards, allowing for different types of DAW connections such as, FireWire, ADAT, MADI, and Dante. Ultranet: Ultranet is a proprietary protocol, utilizing CAT5 cable, that allows up to 16 channels of personal monitoring using Behringer's optional P16-M personal monitor mixer. This allows musicians to customize their own monitor mix. Multiple P16-M units can be daisy-chained or used with a P16-D Ultranet distributor. View: All of the main control sections of the mixer include a View button allowing that parameter to be displayed on the 7" LCD display. This makes for easy editing as well as adding more detailed options than the front panel controls include. X32-Mix: This iPad app lets you control all 32 mic inputs, 8 AUX inputs and 16 buses, as well as the FX stereo returns and more. X32-Q: This app, for iPhone and Android, allows each artist to adjust and tweak their own monitor mixes. 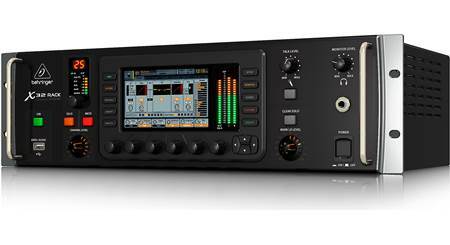 Bus Master - This allows level adjustment of the 16 Mix Bus Masters. Select button - This directs the control focus of the user interface, including all channel related parameters, to that channel. At any given time, there can only be one Select button activated. Six segment LED level meter with Gate and Compressor indicators. Customizable color LCD scribble strip. Config/Preamp: This section provides an input Gain knob with an 8-segment LCD level meter, 48V Phantom power and phase reversal switches, a Low-cut filter switch with corresponding Frequency dial. Gate/Dynamics: A Gate/Ducker switch engages the noise gate and the Dynamics button activates the Compressor, with each having their own corresponding Threshold dial. Both functions also use an 8-segment LCD strip for level adjustment. Equalizer: An Equalizer button activates this section with 4 frequency bands that can be adjusted: High, High Mid, Low Mid, and Low. A Mode button determines the type of EQ: Low Cut, Low Shelf, PEQ (standard parametric), VEQ (vintage style), High Shelf, High Cut. Other controls include a Frequency knob, a Q knob (adjusts the bandwidth of the selected frequency), and a Gain knob for the overall level. Bus Sends: Four bank buttons along with four corresponding level controls allow quick adjustment of the Bus Sends. A View button allows editing and routing on the LCD screen. Main Bus: Mono Bus and Main Bus buttons determine if the selected channel is assigned to the Main Mono or Stereo Bus. A Pan/Bal knob adjusts the overall left-to-right positioning and a Level knob adjusts the overall level. USB Recorder: This section has a USB (Type A, 2.0) port for installing firmware updates and for recording performances. Main/Solo Meters: A 24 segment LED meter displays the main output level as well as the solo level of all channels whose Solo buttons are active. Category Select Buttons: Eight Category Select buttons along the side of the screen provide quick editing access to all the main functions of the mixer. These include: Home, Meters, Routing, Setup, Library, Effects, and Mute Group. The eighth button, Utility, accesses certain utility functions within each of the previous seven options. Push Encoders: Six push encoders are provided along the bottom of the LCD screen that allow quick editing of that particular function within any of the editable screens. Layer Buttons: Some screens in the Main Display have more than six editable parameters which can be accessed by the Layer Up/Down buttons. Page Select Buttons: These two buttons will scroll through the available screens or confirm/decline certain actions. Monitor Level: Adjusts the level to the Monitor outputs. Mono: Switches the Monitor output to mono. 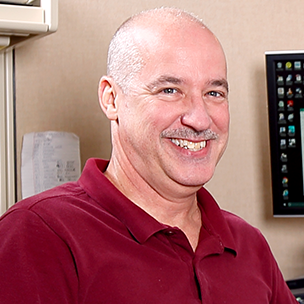 Dim: This button will attenuate the Monitor signal. The amount of attenuation can be set, along with other Monitor settings, when the View button in this section is activated. Talk A/B: These two push-buttons allow either the built-in talk mic or an external mic to be used for Talkback. Ext Mic: A balanced XLR connection is provided for an outboard talkback mic. Talk Level: Adjusts the talkback volume. Lamp: This socket can be used for a 12VDC/5W console lamp. Eight DCA (digitally controlled amplifier) groups: DCA groups are useful in situations where you have a collection of similar signals, and you want to quickly adjust their overall level, but also easily adjust the individual levels of the channels assigned to the DCA group. Mix Bus masters 1-8: A "Bus" is a combined set of channel signals where each channel feeding the bus can be done so with a variable level, such as an effects loop, where different channels feeding the Bus for the effect need to be at different levels. 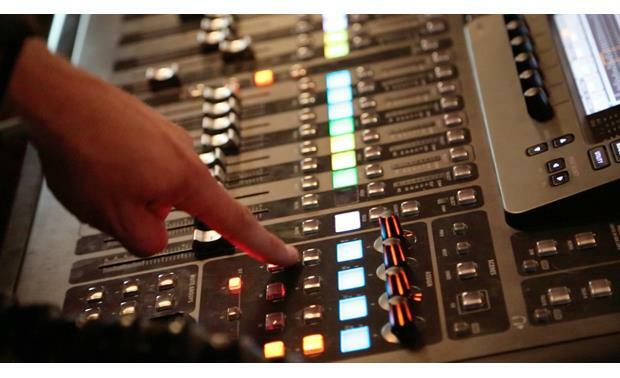 This setting lets the faders control the busses for channels 1-8. 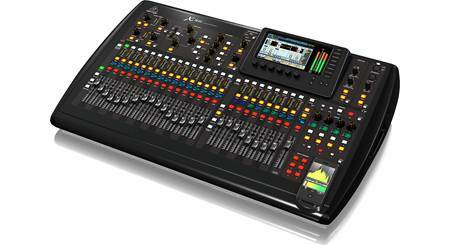 Mix Bus masters 9-16: Allows the faders to control the busses for channels 9-16. Matrix Outputs 1-6/Main C: Controls Matrices 1-6 and the main center bus. Scenes/Assign/Mute Groups: This assignable controls section lets you take the adjustments you make the most and assign them to a group of dedicated controls. It includes 8 buttons, 4 knobs, and 4 LCD scribble strip screens that will display the currently assigned function. Additionally, the controls are divided into three groups A, B, and C, allowing for a total of 36 different assignable functions. This is also where Scenes can be saved/recalled and Mute Groups are assigned. Scenes: This section contains the controls for storing/recalling Scenes. A Scene is a "snapshot" of all of the settings and parameters of the mixer and can be stored/recalled at any time. Controls in this section are: Prev, Next, Undo, and Go. Assign: The Assign section has 8 buttons that can be assigned to any function for quick access. There are also 4 assignable knobs with corresponding LCD displays that show the current parameter. A, B, and C buttons switch between the three banks of Assignments. Mute Groups: 6 Mute Group buttons can be programmed to mute multiple channels simultaneously with the push of one button. Inputs 1-32: All the 32 main inputs into the mixer are female 3-pin balanced XLR connections with MIDAS preamps. Auxiliary In/Out: This section provides six 1/4" balanced TRS connections and a pair of stereo unbalanced RCAs for the Aux Input and a duplicate set of the same plugs for the Aux Output. Outputs 1-16: The X32 provides 16 assignable male 3-pin balanced XLR output connections. Outputs 15 and 16 act as the Main Left/Right output. 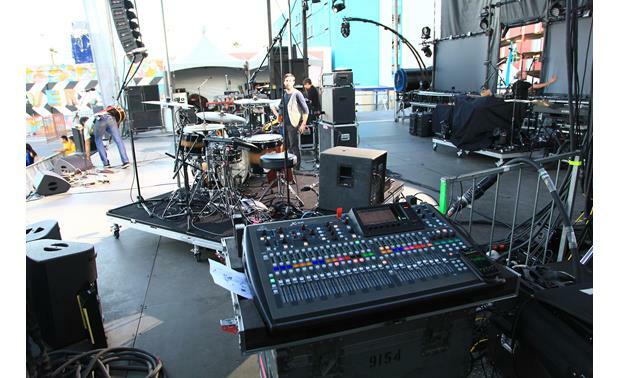 Monitor/Control Room: The Monitor out section includes a stereo pair of balanced male XLR connections and a pair of stereo 1/4" balanced outputs. X-USB Card Slot: A USB (Type B, 2.0) connection allows up to 32 channels of audio to be transmitted to and from a computer. This card is removable and can be replaced with other optional expansion cards such as FireWire, ADAT, MADI, and others. Remote Control: A USB (Type B, 2.0) and an RJ-45 connection are provided for remote control from a computer. MIDI In/Out: Female MIDI In and Out connectors can send and receive MIDI commands via standard 5-pin DIN cables. These provide MIDI integration with a DAW or recording software. AES/EBU Out: Allows the Main signal to be sent out digitally on a 3-pin AES/EBU XLR cable. Ultranet: This is an RJ-45 port used with Behringer's P16-M personal monitor mix units. These let musicians dial in up to 16 channels of personal monitor mix and can be daisy-chained together or used in conjunction with a Behringer P16-D hub. AES50 A/B: Two AES50 ports (A and B) are provided for digital networking of up to 96 channels of audio over shielded CAT5 cable. This can be used for sharing signals among several X32s or to run to remote stage boxes. Dimensions: 35.0" x 8.75" x 23.875"
where is it damaged? and how extensive is the damage? Thanks for your question. If you are speaking of the scratch and dent stock there will be some very minor cosmetic flaw. These open-box items have minor cosmetic damage.They may be missing non-essential accessories. In some cases the manufacturer's accessories have been replaced with generic equivalents. The manufacturer's warranty applies as well as Crutchfield's 60 day satisfaction guarantee. Hope this helps. 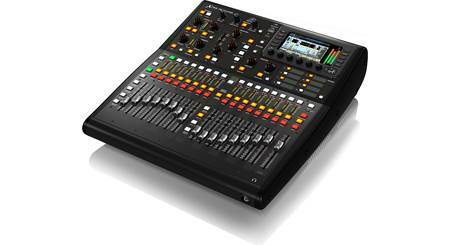 Searches related to the Behringer X32 32-channel digital mixer.